At Advant-Edge, We understand your time is valuable, that is why we felt the need to offer a one stop shop for all of your nursery and landscape needs. Whether you need a tree, plant, a bag of fertilizer or complete landscaping, we can provide it. So, if you are going to do it yourself or leave it to the professionals we can help. We have everything to help complete your new outdoor environment or add to your existing, and if we don't have it, we will try our best to get it. We also have full displays as well as water features that will help you envision your outdoor masterpiece. We can also provide gardening advice as well as tips to make the best of your landscape. 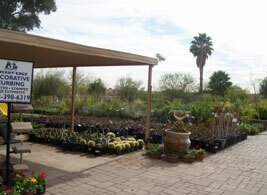 At Advant-Edge nursery we grow 90% of our plants in house and provide over 98% Arizona grown plants.